Like most of us, I shot film until digital came along, and then my backpack of expensive German glass languished in the cupboard for years. That lasted until five years ago, when I bought a 1920 Kodak for $10 on eBay and ran my first roll of film through it. Although light leaks and bad exposures plagued most of the frames, one image of an antique gas station was excellent, with pleasing color and subtle tonal gradation. I was hooked. I realized for the first time that equipment from the early part of the century could produce striking, professional-quality images. Better yet, I achieved beautiful results with both black and white and color film. 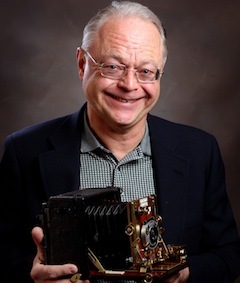 As a result, most of my work is now done with my collection of cameras made between 1900 and 1950. They don’t just sit in their display cabinets, either. My cameras, the result of many hours of patient restoration, are old and beautiful, but they’re like sled dogs – they work for a living. I have developed this site to share with others the wonderful rewards I have gained from working with these old masterworks of brass, glass and leather – not just the pleasure of owning or collecting vintage cameras, but of actually using them and seeing the wonderful images that they can produce. I hope to share with you what I have learned about locating and evaluating usable old cameras, cleaning and restoring old leather, brass and glass, and the many quirks and peculiarities of uncoated lenses, spring-powered shutters, and archaic f-stop systems. In between, I may add some thoughts on the creative process and a few stories about my adventures as an itinerant vintage camera photographer. I hope that you find even a fraction of the rich pleasure that I have gained from these wonderful old machines.